Resellers and distributors of Sure-Foot’s anti-slip safety products believe in our field-tested quality. Trusted and versatile, our products can be used in a variety of applications and even built to custom measurements for non-traditional uses. When our safety product resellers run into flooring concerns within their own operation, they naturally turn to Sure-Foot to assess a problem and offer a solution. A floor maintenance and cleaning company in Georgia dispatches several work vehicles to daily jobs. Vehicle trailers are utilized to transport heavy duty equipment like commercial floor buffers, steamers, and sweepers. 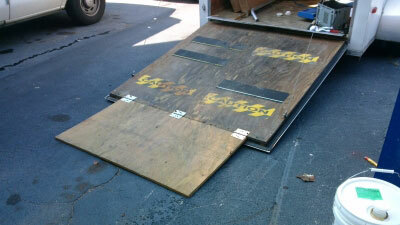 Each trailer has a wooden back door that folds down, becoming a ramp from the trailer to the ground for easy loading and unloading of the equipment. The wooden incline’s high traffic caused surface wear, becoming slippery for workers who handle heavy equipment, water, and various cleaning solutions. Like many other companies with a labor-intensive workforce, the floor maintenance business is concerned with liability, worker’s compensation and most importantly the overall safety of its employees. Being a reseller of Sure-Foot products already, the floor maintenance and cleaning company applied our anti-slip tapes directly to the wooden door to improve footing. But when the tape alone didn’t provide adequate traffic support and slip resistance, the company contacted Sure-Foot for a suitable solution. Sure-Foot’s approach to a potential safety concern is always the same, first collecting relevant information about the problem and then assessing all possible answers. The solution needed to be long-lasting and lightweight as the door is handled multiple times per day. While the company’s attempt at adding anti-slip tape was a step in the right direction, the uniqueness of the problem, including the large surface area of the folding door, made it clear a custom application would be necessary. Sure-Foot believed total coverage of the folding door was the best solution. 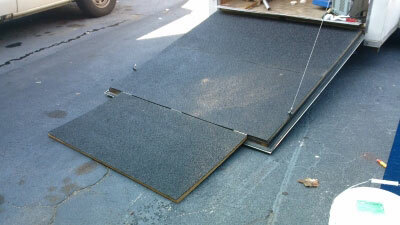 Flat fiberglass panels with a black-medium grit were measured to meet the exact dimensions of the foldable work ramp. The panels were .125” in thickness and designed as a seamless walkway. Fiberglass’ durability and toughness met the long-lasting needs of the application, without adding significant weight to doors that are lifted and lowered multiple times throughout the day. Delivered to the customer ready for installation, the panels were quickly implemented using both an adhesive and screws placed directly into the wooden door and folding panel. Sure-Foot’s tailor-made fiberglass door panels delivered the superior anti-slip performance and lifetime value the customer needed. Field employees now have added security as they enter and exit the work trailer with equipment, while maintenance appreciates the easily cleaned surface. Initial installations of the fiberglass door panels have been so well received that the customer has outfitted other similar trucks with the same solution. Protecting workers is essential for many businesses and proactively improving safety in your operation helps productivity and the bottom line. If you are interested in the long-lasting safety benefits of Sure-Foot’s Fiberglass Step Cover solutions,  request a sample today.